A computer game called Bully in which players apparently hurt other pupils in a school has been condemned by anti-bullying campaigners. 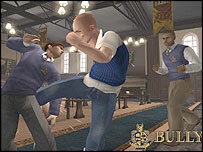 A screenshot from the game depicts one student kicking a classmate while another looks on. Liz Carnell, director of Bullying Online, said she was concerned younger viewers would access the game. But the maker of Bully, Rockstar, said the game was still a "work in progress" and it was too early to judge it. Ms Carnell told the BBC News website: "Bullying is not a suitable theme for a game. It diminishes the suffering of victims. "And such games give the impression that these types of experiences are normal. We are very concerned that they have an effect on young people." Ms Carnell said it was impossible to underestimate the effects of bullying, and that people suffered the effects well into adulthood. "We are contacted by up to four children a day who are suicidal, and many many more who have suffered injuries and trauma. "I've had dozens of complaints from people who find this game offensive," Liz Carnell added. "But I've also had dozens of hate e-mails, some of which have been very abusive. "I think this demonstrates the type of person this game is targeted at." Rockstar Games has said it does not yet have a synopsis for the game, but gaming magazines have reported that Bully features a pupil at a school for juvenile offenders who assaults both other pupils and teachers. Screenshots released by the company show a pupil outside a school called Bullworth Academy, and inside kicking another pupil. A Rockstar spokesman said its video game should be judged in the same way as any other work of fiction. "We take the problem of violence in school very seriously and support groups trying to address it," he said. "But we have different views on art and entertainment. People should not judge what is work in progress. "The theme is not the only aspect of Rockstar's games - they have been consistently praised for their strategies and the experiences they offer players." He added that Rockstar hoped to have a constructive dialogue about the game with anti-bullying charities once it was finished. A spokeswoman also reportedly told Bullying Online that the game's content would be no worse than the Just William series, Richmal Crompton's tales about a mischievous young schoolboy which was turned into a teatime television drama. Rockstar has invited Bullying Online to New York to see the game for themselves. Last week youth group Peaceaholics staged a protest outside the company's headquarters there in protest at plans to release Bully. Rockstar is also behind the Grand Theft Auto games. Grand Theft Auto: San Andreas received an adults-only rating (18+) in the US after a fan of the game created a patch which unlocked explicit sexual content. Recent research has suggested parents tend not to heed age certifications on video games. The study carried out by the UK gaming industry found many parents thought their children were mature enough not to be influenced by the content of the games, and parents tended to view them as a guide to the content rather than a prohibition. A spokeswoman for the Department for Culture, Media and Sport said she could not comment on individual games. She said all games classified either as suitable for over-15s or over-18s by the maker of the game were then considered by the British Board of Film Classification for certification. Symbols indicating content suitable for over-15s or 18s have recently been doubled in size, and the gaming industry decided voluntarily to introduce written warnings of adult content on the game box. "We know that parents don't necessarily expect games to be violent by nature of the fact that they are games, so it's useful to have an explanation on the box," the spokeswoman said. But Ms Carnell said all the evidence showed under-age game users were able to access unsuitable games.